When cleaning your gutters, some of the tools needed are an extension ladder, a bucket with hooks on it, gloves, and a gutter scoop to scoop the leaves and debris out of the gutters. When setting up your ladder, make sure the ladder is set on level ground and is stable. Set your ladder at a 75 degrees angle, which is the ideal climbing angle. When climbing the ladder, always have both hands on the ladder to prevent falls. Remember, always think of being safe when climbing ladders. Make sure you check for overhead obstructions before placing the ladder. The most dangerous of all are powerline. Always work from the ladder and never get on the roof unless absolutely necessary. Scoop the debris out of the rain gutters and dump debries into the bucket. Always have one hand on the ladder to avoid losing your balance and falling off. Move the ladder after scooping a few foot of gutters and never reach too far. This prevents the ladder from falling over. Once the debris is all scooped out, check the downspouts to make sure they are free of debries. If they are cloogged, use a water hose with a pressure nozzle to clear out the debris. 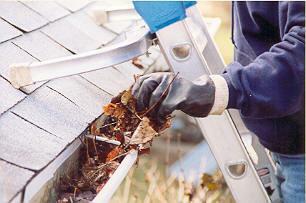 Cleaning your gutters can be a difficult and dangerous task. Sometimes better left to proffessionals. So when you are ready for clean gutters in Houston Tx, it is sometimes better to hire a proffessional. For proffessional Gutter Cleaning in Houston Tx, contact SMC Cleaning Services at 281-899-0402. You can also fill out the form below for a free quote.